How can USB sticks be dangerous? We all know the story of the USB drive left outside a power plant which was found by a worker and inserted into a computer to see the contents which then allowed a hack to ensue. Here is my question, how? I get that code is executed but how? I would really like to be able to do this (for my own curiosity of course). I have always had a good grasp on security how to make things secure etc etc but things like viruses, trojans, USB drivers... how are they activated with little human interaction? I would really like to learn about these things, I am a programmer/sys admin so would like to knock up a script but having never been taught or never have done it I don't know how or where to begin. I would really like a big discussion on this with as much information as possible. "But that's not a keyboard! That's an USB drive, silly!" Actually, no. It looks like a USB drive to you, but when it gets connected to a computer, it will report that it is a USB keyboard. And the moment it is installed, it will start typing key sequences you programmed on it beforehand. Any operating system I know automatically trusts USB keyboards and installs them as trusted input devices without requiring any user interaction the moment they are connected. There are various payloads available for it. For example, there is one which types the keyboard input to open a shell, launches WGET to download a binary from the Internet, and runs it. Recently, a form of attack has surfaced which does not "hack" the computer through code or software vulnerabilities, but instead does actual damage to the electronics. A creator known as Dark Purple created a device known as the USB Killer 2.0 (based on an earlier version created by him based on the same concept) which, when plugged into the USB slot of the computer, stores the small amount of power sent to the device in capacitors, and then sends the stored energy back all at once at -220 volts. 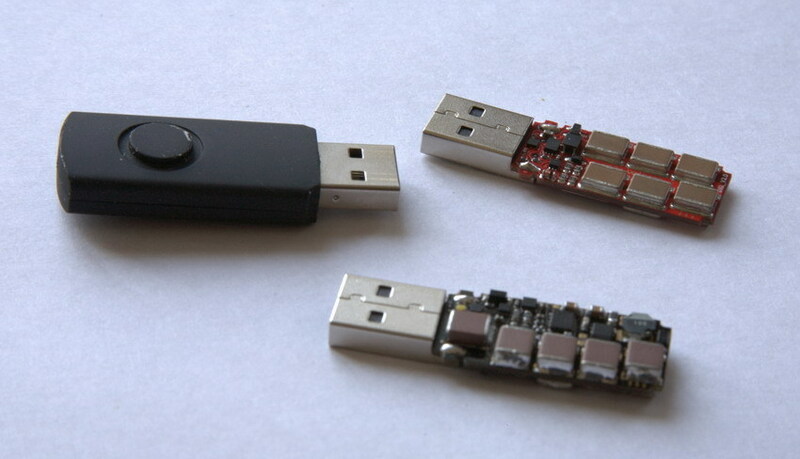 On the right, the exposed USB Killer 1.0 and its successor, the USB Killer 2.0, and on the left, the USB Killer in an enclosed case, which looks just like an ordinary USB flash drive. The "USB stick left outside the power plant" you are talking about sounds a lot like the Stuxnet affair. There was a surprising (and satisfying) amount of detail about the technical aspects in the book Countdown to Zero Day. If you are genuinely curious I would highly recommend reading it. To give you a tl;dr for your question; it's not done with a script but rather an file crafted on a lower level to exploit vulnerabilities in the way that the operating system handles USB drives. When you plug a USB drive into Windows, it will try to do helpful things like assess the file structure and see if there are any files you might particularly want to use, in order to give you a prompt to immediately access those files. While it doesn't intentionally execute any of the files directly, there are exploits to the way the OS scans the files that can be used to trick the operating system into executing code. A famous example of what you are asking about is this advisory from Microsoft. The vulnerability referred to is triggered just by inserting the USB stick; no other interaction from the user is required. This is how the Stuxnet virus spread - see e.g. reports from Symantec and F-Secure. These kind of approaches used to work, but due to the high spreading of viruses through pens, the option autorun on operating systems that enabled USBs to run when plugged, was disabled. Before that option was disabled, you could have an EXE file on a USB device that would execute when you plugged the USB into the computer. On recent operating systems the autorun option is disabled by default. A USB device can be re-programmed to emulate a USB keyboard. When the USB device is plugged into the system, the operating system recognizes it as a USB keyboard. Or for a simpler alternative, you can obtain hardware created specifically for that purpose like @Philipp suggested. USB keyboards have the rights of the logged in user and can be used to inject malware into the operating system. Not the answer you're looking for? Browse other questions tagged malware virus usb-drive or ask your own question. Is it safe to insert a USB drive of unknown origin? Is it dangerous to share a USB flashdrive? Is there any way to safely examine the contents of a USB memory stick? How can empty USB sticks contain malware? Can USB drive infect my PC with malware if I don't allow any autorun.inf to run? I found a virus on my USB stick. Now what? Is it safe to connect a random USB battery from a bin to my phone without stopping data transfer in some way? How can kids transfer data to a school computer safely? Are USB thumb drives inherently more dangerous than other removable media? Why? How does one properly check foreign USB Drives before getting them in your Network? Is the presented approach considered “safe”? How can I safely use potentially infected USB sticks from a previous OS installation? Can my PC get infected by a shared USB drive?